The latest ranges of Racetech race seats have a unique and patented back mount distinguishing them from competitors’ offerings. A Racetech seat’s lack of flex during impact – due to the back mount – is a key reason a Racetech seat is the world’s best. Mounting the seat from the back, in addition to the traditional floor mount, enhances the driver’s feel of the race car. Why? Because there’s a lack of flex in the shoulder area which also helps reduce driver fatigue and improves driver safety. Tests have also shown that chassis stiffness is enhanced due to Racetech’s unique six-way mounting method which helps improve car handling and the ability to tune the chassis. Developed in collaboration with the FIA, Racetech seats are used by some of the world’s leading teams and constructors, including the whole field of the Swedish TTA, 21 out of 27 Australian V8 Supercars, the FIA World Rallycross Championship, the British Touring Car Championship and in offshore powerboat racing. Racetech seats are some of the strongest, safest and most supportive seats available. Driver cooling – a simple, nothing-to-fail system that works effectively as proved over and over by most V8 Supercar drivers. Attachment points at the extremity of the head and shoulder supports to ensure side-nets don’t pull away from the seat during impact. All Racetech seats have parallel sides for ease of fitting and driver positioning. The steel of all fixing bosses comes through the composite to ensure ease of bolt thread starting and additional strength at crucial load points. Racetech harnesses and side-nets complement our range of race seats and enhance the safety package in your racing car. 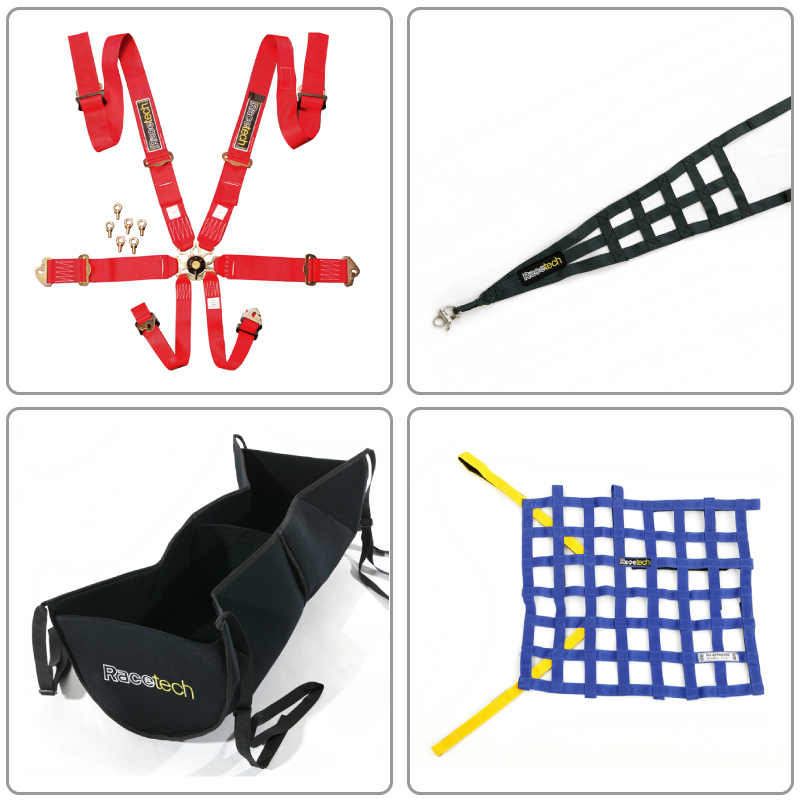 Racetech FIA harnesses are manufactured in UK and sold in many motorsport environments from touring cars, various Formula race cars, rally cars, speedway and sports cars. Racetech side-nets were developed in conjunction with Dodge during the Comp Coupe project in 2002 and have been tested with great success in the US market. V8 Supercars are now adopting this vital additional, cost effective safety product.